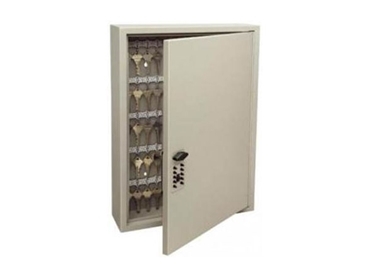 Safes Galore presents a heavy duty range of key storage cabinets from GE Touchpoint designed to hold 120 keys. Featuring 16-gauge steel construction, continuous piano hinge and a resettable digital lock, the key cabinets offer high strength and security. Keys can hang directly on the steel key hooks or on the supplied numbered key tags. The keyless QuickAccess pushbutton lock gives added security and convenience with its unique clutch mechanism preventing forced entry. The entry code to the digital lock can be changed as required with over 1,000 different combinations available.